As a meeting planner, choosing the right vendors can be a daunting task, especially for a service that is not frequently required. Simultaneous interpretation may well be uncharted waters for most but if you are handling meetings for large corporations, associations or international organizations, you will at times be requested to provide this service. You can be ready to respond right now by learning the proper terminology, where to find equipment providers and the questions vendors will ask. Simultaneous interpretation is facilitating the communication of speech from one language to another in real-time allowing presentations or conversations to flow naturally, without delay. The interpreted speech is usually heard by using a wireless receiver with earphone. This service might also be called conference interpretation, language interpretation or even simultaneous translation. Interpreting is a very complex task. You might be surprised at how demanding it is, in terms of interpreter qualifications and the quantity of equipment needed to deliver the service. But the truth is that accurate communication is the most important aspect of any meeting and quality interpretation will ensure its success. What type of equipment is required for Simultaneous Interpretation? Interpretation booths are used to provide sound insulation for the interpreters. They allow them to work in a quiet environment while blocking their voice from distracting the meeting attendees. 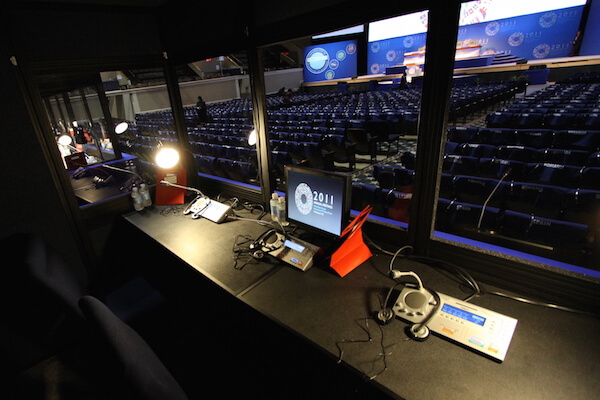 Inside the booths, the interpreters will receive an audio feed of the floor channel (the current speaker in the meeting) and simultaneously interpret into another language. Looking for an equipment provider, you should enquire whether their portable booths meet the ISO-4043 standards or not. If they have the certificate, it is safe for you to assume that the booths will provide proper sound insulation and an adequate working environment for interpreters in terms of comfort, ventilation, lighting and visibility. Detailed information can be found at ISO-4043:1998. Meeting ISO-4043 standards will be an absolute pre-requirement when organizing an event for a prominent international organization. Table-top booths are generally not recommended but are sometimes used in meeting facilities with limited space where a standard interpretation booth is too large. Table-top interpretation booths provide minimal sound insulation and do not meet ISO requirements. The console is the central working station for interpreters allowing them to receive, transmit and control the audio. Two interpreters in a same language booth might share one console but individual microphones are always preferred. With the advancements of digital technology interpreter consoles now have advanced features such as Relay and Auto-Relay for events with multiple interpreted languages, or Repeat allowing interpreters to rewind live audio if they missed a word or phrase. Meeting planners should seek vendors that offer the latest generation interpreter consoles, as they have features allowing interpreters to perform more efficiently. Additionally newer consoles increase the overall fidelity of the audio. Language distribution provides the audio of the interpreted languages to the meeting attendees who require interpretation. For the majority of conferences, this is done wirelessly. In the world of interpretation there are two technologies used to wirelessly transmit language channels: RF (radio frequency) or IR (infrared). - Secure and Confidential. Using IR prevents eavesdropping or confidential information to be heard outside of the meeting room. - More Channels: IR can accommodate up to 32 channels, while RF rarely goes beyond 8 channels. - No need for emitter panels. IR requires a technician to setup emitters throughout the room for coverage. - Multiple-room broadcast from one location: RF signals can travel through walls allowing listeners to be in different rooms. There are a handful of companies that specialize in providing simultaneous interpretation equipment. They would be the ones with the largest inventories, the most advanced equipment and the expertise to advise you on the best solution for different meeting scenarios. The largest conference equipment providers are located in New York, Washington DC, Florida and California, where the majority of simultaneous interpretation events occur. However, most companies travel around the country offering their services. The same companies that rent projection screens and sound systems will sometimes offer simultaneous interpretation equipment. Most A/V companies do not specialize in this service and own a minimal amount of equipment. Other A/V companies will offer the service and sub-rent the equipment from the aforementioned conference equipment providers. LSPs are companies that offer mostly translation, but occasionally interpretation services as well. Some of the larger LSPs have an interpretation department. Usually they specialize in hiring and managing conference interpreters, but some companies provide the equipment as well. Those LSPs who do not own their own equipment will often source the service from conference equipment providers. Conference equipment providers tend to provide the best equipment and the best service. They are able to do this because their business is completely focused on simultaneous interpretation. Their staffs are specifically trained to work with interpretation equipment and interpreters to ensure the meeting runs smoothly. Since interpretation is a niche market, it’s just as essential for the staff to be knowledgeable as it is for the equipment to be up-to-date. What should you look for in an interpretation equipment provider? - Size – usually determined by the number of guests and size of the meeting space. - Location – has the vendor performed work in the country/city/venue? - Client Types – clients within the same industry tend to hold similar style meetings. If the vendor has previous experience working with your client’s competition, they might have a better understanding of the meeting layout. The time it takes a vendor to return calls, provide a quote and answer your questions, says a lot about a company’s overall customer service and reflects on their service during an event. Beyond the general type of equipment offered, check with your prospective vendor the condition of the equipment used, the make and model and when the equipment was purchased. Since the meeting attendees will be in physical contact with this equipment (specifically the receivers) you want to make sure they are not using clunky, outdated equipment. What is the meeting room layout? The floor plan, seating arrangement and venue size will help the vendor determine what type of equipment is needed. Will raisers or a video feeds be provided for the interpreter booths? Interpreters work best when they can see the person speaking. If the room is large or if the sightline is blocked, raisers can lift the booths off the ground providing a better viewing angle. Video assist systems can be used to provide a visual of the speaker on a monitor within the booth. How many languages will be required? In most cases there is one booth, two interpreters and one channel required per language. What is the audio source for the interpreters? If the company providing the interpretation is not providing the audio, they will need to coordinate with the audio provider to get the audio signal for the interpreters. Possibly the most important part of choosing a vendor is how comfortable you feel with them. The criteria mentioned can help you determine what you can expect, but the comfort level that you have with a vendor can set your mind at ease. About the Author: Andrew Murphy manages conference and interpretation at Conference Rental, a lead sub-rental provider for digital conferencing microphones and language interpretation technology. Andrew has worked in the interpretation industry for 10 years and managed events for the 2012 G-20 Summit, the IMF and World Bank Annual and Spring Meetings from 2010-2012 and the ITU Plenipotentiary Conference in 2010. Conference Rental specializes in providing state-of-the-art interpretation solutions for International Organizations, Government and Large Corporations.